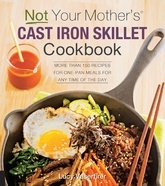 Not Your Mother's Cast Iron Skillet Cookbook is loaded with inventive and tested-to-perfection recipes, including: breakfasts; appetizers and small bites; steaks, roast, and chops; chicken and turkey; fish and seafood; veggie main courses and sides; bread and quickbreads; and cakes, pies, and other desserts.And if you're new to cast iron, don't worry, because this cookbook includes all the details on how to choose, season, cook, and clean your skillet. You'll even learn how to revive an older cast iron pan, and you'll get useful ideas for using your skillet not just to cook on but also as a serving vessel. Just because your mother swore by her cast iron doesn't mean the food you cook on it needs to be boring!